There are many topics about situation in France so I allowed myself to create this thread where we will focus on France-related discussions. Politics, recent events & lifestyle. We will start with shocking news about terrorists attack on satyrical newspaper in Paris with at least 12 people shot dead and 10 severely wounded. Cartoonists fallen in the name of freedom of speech. May they rest in peace. I'm sorry, but what a S.O.B.! I just hope the aggressors will be caught soon. IMHO all European newspapers should publish tomorrow the magazines pictures in the front page. According to witnesses, when leaving the area the terrorists claimed to "have killed Charlie Hebdo". 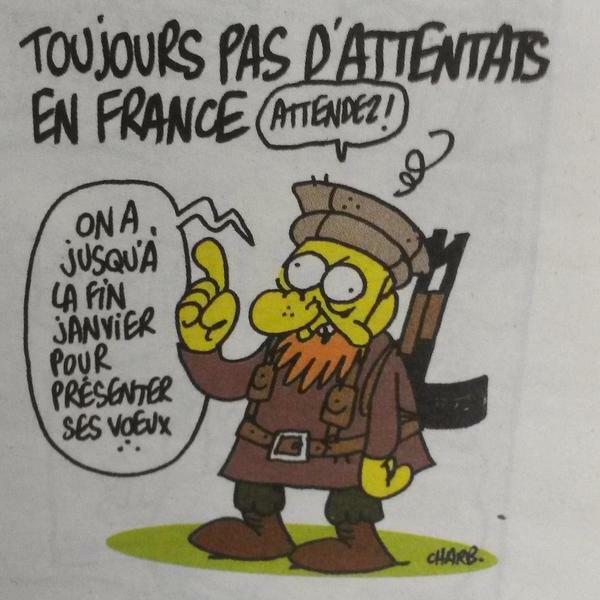 So if you can read french buy and/or subscribe to Charlie Hebdo to prove them wrong. +1 ! That's how we should react ! The blurred images are an insult to the cartoonists who lost their life, they should be ashamed. I can see already what will happen after this but, i think the big loser will be the nationalist party. It's always the same thing in France, whenever elections are near. I don't follow you. What does the "nationalist party" ( I assume you mean the National Front ) have to do with this. The events today aren't over yet, and there's still no political reaction, we don't even know in what direction will they be. So what do you mean? Or you mean that there's always a huge Islamist attack before every French election? Which doesn't make any sense. I'm actually afraid these Front National nutjobs will somehow try to use this attack to their advantage. Their German pendants will probably do the same. Translated comments from French side of Twitter. They don't have any regrets about what happened moreover some of them think that these poor people deserved it. Spontaneous rally in Paris, people holding up pens and pencils to support freedom of speech in our country. This attack will scare the muslim community and they will vote for the socialists (the president said already that the attack will harm the french muslims), because a lot of people there think that if the nationalist party takes over, it will lead agressive policies against foreign communities and especially muslim one, since it weighs a lot in terms of votes. Nationalists, obviously do not want to work for foreign agendas as well, you need to keep this in mind. And this is the kind of propaganda i was talking about. 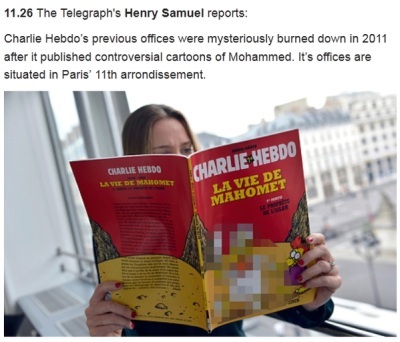 Controversial cartoons : Despite speculation that the attack was a response to Charlie Hebdo's run of controversial cartoons, some publications are taking the decision to reprint them. In Egypt, the daily Al Masry Al Youm newspaper has run a selection of the magazine's illustrations - including the recent cartoon lampooning Abu Bakr al-Baghdadi, the leader of Islamic State. I'm afraid you mix a lot of things. First. Who has damaged the most the French Muslim community is whoever committed the attack. Second. The possible effect on the votes its still to be determined, it depends of how every party reacts in the next days. For example 11M Islamist attacks in Spain lead to the fall of the right-wing PP. So just the opposite effect you are talking about. Third. That the National Front has some Nationalist ideals, doesn't mean that Nationalism equals to aggressive policies against foreign communities. The freedom of speech is one of the most important rights in a Democracy. What those terrorists want precisely is to avoid the World to see that kind pictures. So the proper reaction is to show the images to all the World, to show that terrorist can't affect in our most essential rights. 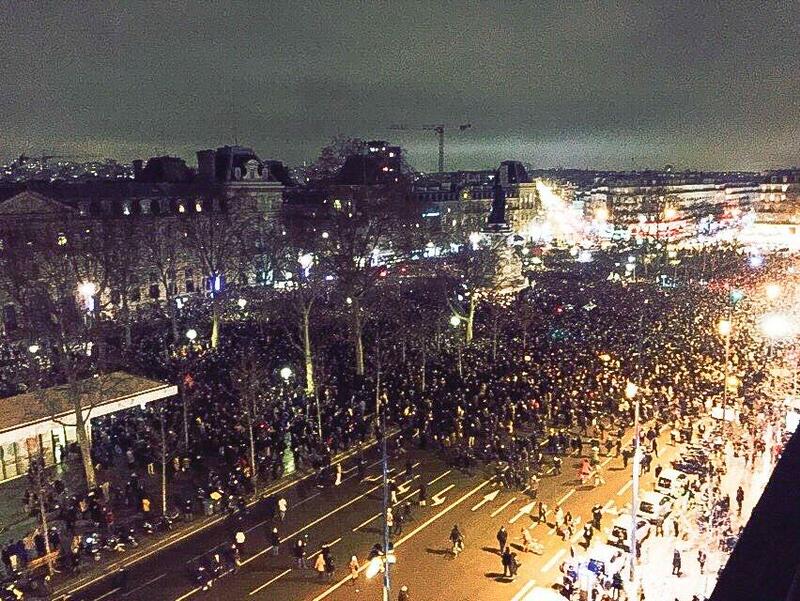 "Still no attacks in France. "We have until the end of January to present wishes", says the terrorist". Why would that be overreacting? What can they do? Kill every journalist in Europe? If they did this attack to kill that satirical newspaper, then the only appropriate reaction is to make it immortal. Put those caricatures on every newspaper in europe and you send a clear message to all extremists. You can kill some of us, but you canÂ´t kill us all or break our will to express ourselves. Unlike some 'free press' I won't name that scumbags "dissidents" or "freedom fighters"
Really did they named it like that? I'd be surprised it was in the UK haha, where all musilm related perps are described as "asian looking" people - which sadly turns all suspicion to proper Asian people like Chinese, Filipino or Indian. Well, apparently, the level of analysis here is very "simplistic", i go back to my nest. Maybe emotions aside for a bit, and more reading instead ? you need to read about the political setting in France right now to understand my point. Proftournesol, which i doubt is honest, can help you with that instead of posting ridiculous caricatures. According to Le Point, the killers are two franco-algerian of 32 and 34 yo (and a young homeless of 22 yo), coming back from Syria and already involved in 2008 in the recruiting process of fighters sent to Irak. Considering how they behaved during the slaughter, they were obviously trained fighters, and they were perfectly speaking French with a North African accent. So this lead seems believable. It's the same scumbags like those who seized theatre in Moscow. In some 'free press' (not some third party tabloid but one of largest media companies) those who committed attack in Moscow were named 'dissidents'.